Production Design & Art Direction by Peter Ettedgui is the second book in the Screencraft series published by RotoVision. The 16 production designers featured in the book, which retails at £27.50, encompass three generations of film-making, representing a diversity of film cultures. 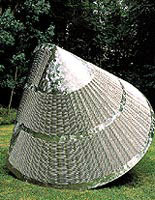 Sculpture at Goodwood, written by Ann Elliott and edited by Angela Dyer, is dedicated to the commissioning, promotion and sale of British contemporary sculpture. It is priced £10. Contact: the website at http://www.sculpture.org.uk or telephone 01243 538449.